The Rongai Route is the only trail to start on the northern side of the mountain. It is a lovely path involving an ascent of some 26.8km to the summit if taking the direct route, or 37.65km if taking the more sensible – and beautiful – diversion via Mawenzi Tarn. The descent route is Marangu, adding a further 36.75km or so to the total. Though previously fairly quiet, the improvement and enlargement of the road around this eastern side of Kili combined, perhaps, with our effusive praise of the route in previous editions of the guide, has meant an increase in trekkers on the Rongai Route over the past couple of years, and we expect this trend to continue. The following itinerary is for six days and follows the diversion via Mawenzi Tarn – as we believe more people take this route nowadays. Remember that most people take seven days on this route though it can be done in as little as five – though we think this is entirely too fast and neither recommend it nor, indeed, arrange such a brief trek for our clients. It is an inauspicious start to the trek, our guide taking us up the slopes through what, for many trekkers, is the less-exciting part of Kilimanjaro, a hot and dusty blemish of pine plantations followed by fields of potato and maize, pockmarked here and there with the wooden shacks of those who eke out a living from the soil. It is just about an hour before we turn right and escape into the lush green haven of the forest. When we do so, we’ll be disappointed to find just how quickly the tall trees of the montane forest give way to the more stunted vegetation of the heathland, such as giant heathers and St John’s wort. Still, narrow though it may be this band of forest is still teeming with wildlife, in particular colobus monkeys, with a troop often grazing by the entrance to the forest. Leaving the forest on a trail that slowly steepens, about 50 minutes afterwards we cross a stream and a few minutes later reach the first campsite on this route, known as the Simba (or Sekimba) Campsite, at an altitude of 2635m. It’s always good to get to a campsite, and this one in particular is pleasant: surrounded by heathers, with creatures snuffling about the tent at night and birdsong to wake us in the morning, this spot has a pleasingly wild, isolated ambience. The path at the start of this 11.75km stage is, perhaps surprisingly, a westward one, its goal seeming to be the northern slopes of Kibo rather than the eastern slopes we will eventually climb. The heathers are gradually shrinking in size now too, and while some trees still cling on at this altitude, they are few in number and scattered. For these reasons, the first part of this stage is rather shadeless and very hot. After 45 minutes a river bed (dry for the best part of the year) joins us from the left and the path follows its course for most of the next hour. Look back occasionally and, weather permitting, we should be able to see a number of villages on the Kenyan side of the border, the sunlight glinting off the metal roofs. Continuing upwards, the path steepens slightly and begins to turn more to the south. The terrain up here is rather rocky and bumpy. The path continues south-south-west, rounding a few minor cliffs and hills and crossing a number of false summits, before eventually flattening out and arriving at a small, waterless cave – the First Cave. As inviting as the cave and the shade it offers now appear, this is not our lunch stop. That lies 20 minutes further on through lizard country of bare rocks and long grasses and is known as the Second Cave (3487m). From Simba Campsite the path takes an abrupt south-easterly turn directly towards the jagged peak of Mawenzi. Traversing open moorland the path meanders and undulates; assuming we’ve already walked from Simba Camp this morning, we will feel rather drained by the time we stumble into Kikelelwa Camp, situated by a couple of caves by the Kikelelwa River, with giant groundsels and lobelias flourishing nearby. (Incidentally, I don’t know why this should be so but whenever I have walked this stretch of the path – which must be a good half-dozen times now – it has always been either raining or very misty. That said, it has always brightened up in the evening to reveal Kibo’s snowy summit peaking over the ridge that separates the campsite from the Saddle.) Compared to the morning where we gained over 850m, this afternoon’s walk increases our altitude by less than 200m, though the distances of the two parts are about the same and, given the amount of climbs and falls, this latter walk is just as exhausting. Though this stage to Mawenzi Tarn (4302m) is relatively short at less than 4km and is usually completed in a morning (allowing time for a brief acclimatization trek in the afternoon for those who feel up to it), it’s also steep as we gain over 600m, the path shedding the moorland vegetation as it climbs steadily. Mawenzi Tarn Hut Campsite is situated in one of the most spectacular settings, in a cirque beneath the jagged teeth of Mawenzi. There’s a small ranger’s hut here and a toilet block. Assuming the walk here was trouble-free we will have most of the afternoon to go on an acclimatization climb up the ridge to the west; if we’re lucky, the sky will be clear, affording us fantastic views of Kibo, though in all probability we’ll merely catch the odd glimpse through the clouds that usually roll in across the Saddle in the afternoon. But no matter, for we’ll get the same views tomorrow morning when the skies should be clearer and the sun will be behind us too. The views back down to the Tarn – which, to be honest, is little more than a puddle with delusions of grandeur – are great too. This lovely day begins with a slight retracing of our steps before we strike out westwards, crossing the ridge and dropping down the slope to tiptoe along the beautifully barren Saddle’s northern edge. With views like screensavers to east and west, it’s a rare trekker indeed who doesn’t rate this day as their favourite on the mountain. The flora is sparse but do look out for eland which are said to stroll up here. We have two destinations at the end of this third day: School Hut (Map 6) or, more usually these days, Kibo Huts. 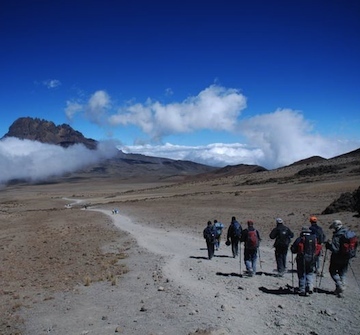 Both lie on the lower slopes of Kibo and both are just a few hours’ walk away. Rising at around midnight, we begin our slow march up to Gilman’s Point (5719m) on the edge of the Kibo crater, past such features as Hans Meyer Cave (5259m). It’s a steep, slow, cold march and a test of our endurance – this is where we’ll earn our Kilimanjaro certificate. Nevertheless, providing we have avoided altitude sickness and have acclimatized well, there is no reason why we shouldn’t make it up to Gillman’s. This we reach, all being well, at around 5am, though it can be much later depending on both our condition and the conditions on the mountain. After a rest at the top, we continue back down to Kibo Huts – a walk that is considerably quicker than it was on the way up! At Kibo we take breakfast and relax for an hour or so, before continuing our march down the mountain, through the Saddle, heath and moorland zones before stopping, finally, at the Horombo Huts once more. We should arrive there at about 4pm – and we have been walking for around 16 hours, less breaks! Exhausting but, if we made it to the top, we’ll think it was worth it! And so we come to the last day of our trek, as we march back through the forest to Marangu Gate, smiling smugly at all those coming up the slope the other way. Stopping at the Mandara Huts for lunch, we continue heading down until we once more reach Marangu Gate, where those who conquered the mountain – or at least made it to Gillman’s Point – collect their certificates. A jeep will be waiting to take everyone back to their hotel – and the land of cold beers and warm showers. Our adventure of a lifetime is at an end – and civilization will rarely have felt so good!